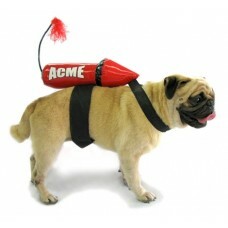 PetHangout is pulling some tricks out from Wylie Coyote with our Funny Acme Dog Costume from our Cool Dog Costumes collection. Your doggie will be ready to launch into the wild blue yonder! PetHangout has more wonderful outfits like our Pretty Flower Dog Costume and Unicorn dog costumes.